Femoroacetabular impingement (FAI) is a condition in which extra bone grows along one or both of the bones that form the hip joint, giving the bones an irregular shape. The bones rub against each other during movement because they do not fit together perfectly. Over time this friction can damage the joint, causing pain and limiting activity. The hip is a ball-and-socket joint. The socket is formed by the acetabulum, which is part of the large pelvis bone. The ball is the femoral head, which is the upper end of the femur (thighbone). A smooth cushion-like tissue known as the articular cartilage covers the surface of the ball and the socket creating a smooth, low friction surface that helps the bones glide easily across each other during movement. The acetabulum is ringed by strong fibrocartilage called the labrum. The labrum forms a gasket around the socket, creating a tight seal and helping to provide stability to the joint. In FAI, bone overgrowth — called bone spurs — develop around the femoral head and/or along the acetabulum. This extra bone causes abnormal contact between the hip bones, and prevents them from moving smoothly during activity. Over time, this can result in tears of the labrum and breakdown of articular cartilage (osteoarthritis). 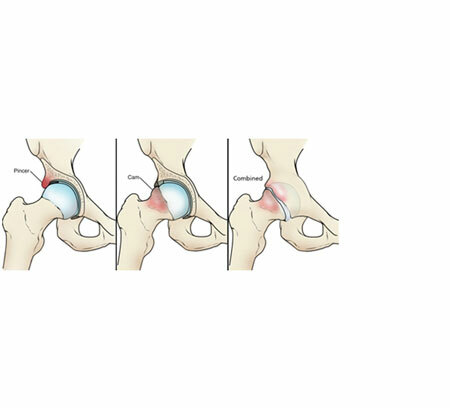 Pincer- This type of impingement occurs because extra bone extends out over the normal rim of the acetabulum. The labrum can be crushed under the prominent rim of the acetabulum. Cam- In cam impingement the femoral head is not round and cannot rotate smoothly inside the acetabulum. A bump forms on the edge of the femoral head that grinds the cartilage inside the acetabulum. Combined- A combination of Pincer and Cam type impingements are present. FAI occurs because the hip bones do not form normally during the childhood growing years. It is the deformity of a cam bone spur, pincer bone spur, or both, that leads to joint damage and pain. Because athletic people may work the hip joint more vigorously, they may begin to experience pain earlier than those who are less active. However, exercise does not cause FAI. Pain - Pain often occurs in the groin area. Turning, twisting, and squatting may cause a sharp, stabbing pain. Sometimes, the pain is just a dull ache. X-rays- These provide good images of bone, and will show whether your hip has abnormally shaped bones of FAI. X-rays can also show signs of arthritis. Computed tomography (CT) scans - More detailed than a plain x-ray, CT scans help see the exact abnormal shape of your hip. Local anesthetic- Your doctor may also inject a numbing medicine into the hip joint as a diagnostic test. If the numbing medicine provides temporary pain relief, it confirms that FAI is the problem. Activity changes- Simply changing your daily routine/avoiding activities that cause symptoms. Medications- Pain Killers and anti-inflammatories help reduce pain and inflammation. Physical therapy- Specific exercises can improve the range of motion in your hip and strengthen the muscles that support the joint. Arthroscopy - Arthroscopic procedures are done with small incisions and thin instruments. During arthroscopy, your doctor can repair or clean out any damage to the labrum and articular cartilage as well as correct the FAI by trimming the bony rim of the acetabulum and also shaving down the bump on the femoral head. While there is a small chance that surgery might not help, it is currently the best way to treat painful FAI.